A Rare Stainless Steel Oyster Perpetual UAE Air Force Pepsi Bezel GMT-Master Vintage Gents Wristwatch, original matte black dial with hour markers, date at 3 0'clock, red time zone hand, a stainless steel bi-directional rotating bezel with a blue and red "pepsi" bezel insert, a brushed stainless steel oyster bracelet with a brushed stainless steel deployant clasp, plastic glass, automatic movement, in excellent condition, comes complete with a Rolex box and Undated Punched Papers. N.B. The arabic writing at 6 0'clock on the dial reads "Mohammed bin Rashid Al Maktoum", the Vice President and Prime Minister of the United Arab Emirates and Emir of Dubai. It is believed he issued 5 of these timepieces to members of the United Arab Emirates Air Force. 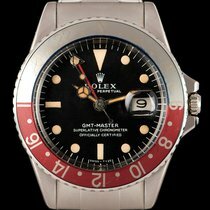 The authenticity of this watch can be verified by the Punched Papers, which carry no country code or dealer stamp, proving it was not sold from a traditional authorised retailer. To find this watch in this condition along with the original Punched Papers, is very rare and would make an excellent addition to any collection.